In a gripping, heart-pounding, and emotionally arresting world premiere, Magic Theatre presents Ashlin Halfnight’s The Resting Place – a play that forces us to ask ourselves, “What would we do if our son or brother committed a heinous crime?” If he also took took his own life in despair, how would we remember his life? Honor his passing? Deal with our own grief? Would we do anything but just try to hide from our enraged neighbors and now-former friends? How would we face anyone in our town who had been a victim or connected to a victim? Is forgiveness possible – even for a family member we had dearly loved, even adored and admired with all our hearts until just two days ago? 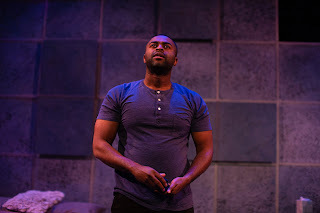 The power of Ashlin Halfnight’s must-see new work is that he raises in our minds many such important questions without providing any quick resolutions. He opens the closed window blinds of the family in hiding and compels us to see the story we never take the time to consider -- the life-altering effects on the family of the accused. Annie arrives at her parents’ Michigan home in boots and insulated vest from a remote yoga retreat, two days after the suicide of her accused brother, Travis. She is greeted by distraught parents, Mitch and Angela, and her sister, Macy, who left in the peak of running a political campaign to be with her family. With sleeves rolled up and a list on her laptop of things to do, Annie arrives ready to plan all the details of a funeral and a burial in the family plot of their church. But Annie has no intention of letting her family “erase or incinerate” the memory of her brother. Martha Brigham is nothing short of heart-achingly brilliant in her role as the ever-tense and eminently intense Annie, who brings to this fight for her brother’s memory the same crusading fervor she uses professionally as a warrior for social justice causes. Annie is black-and-white with little gray. There is a right and a wrong way to everything and everyone; and with every ounce of her being as voiced sometimes with near-tear tremors and other times with ear-shattering shouts full of expletives, she lets her family know it is wrong not to honor Travis’s passing – no matter what he may have done to others. Macy is choosing to be the business manager that she is, to look dispassionately at the facts, weigh the costs and benefits, and make a decision with the least fall-out for the family – and one that will allow her quickly to get on the plane and back to her political campaign. Emily Radosevich is a Macy who rolls her eyes in near disgust at her sister’s newest war against the world around her and who tries to reason with a non-listening Annie “we still have a family to look after.” But her Macy also has a line where she no longer can be the more cautious, rationale manager. Like each of these family members, she has moments of explosion of extreme emotions – some pent-up from family history and some coming from new clues and revelations of who these people really are that she calls her family. The yin to Annie’s yang is her father, Mitch, given by Bay Area revered James Carpenter yet one more jaw-dropping performance among this formidable cast. 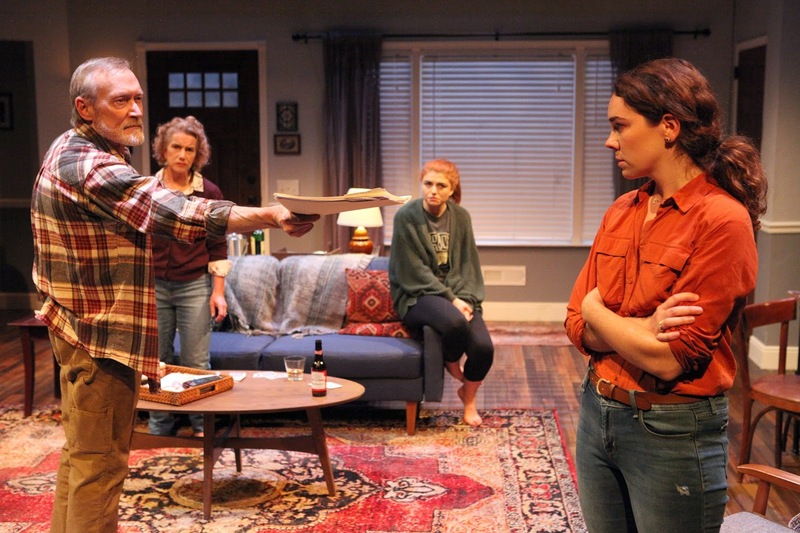 His Mitch is at times a soft-spoken, flannel-shirt-wearing dad who gently tries to steer his daughters – especially the pressing, passionate Annie – to a peaceful resolution of their horrendous dilemma. But at other time, his Mitch is an erupting volcano of self-defenses, justifications, and accusations, throwing f-bombs with a shouted venom enough to cause bones to shutter. Before us, we see what families are too often capable of doing to each other, in all extremes. While the script is wrenching and raw without boundaries at times, who cannot help but recognize the possibility and probability of any family – including our own families -- reacting in much the same ways under circumstances similar? Joining this stunning foursome are two briefer appearances by young men who had associations with Travis. Wiley Naman Strasser enters as the still-in-shock ex-boyfriend, Liam, who too must deal painfully wondering what clues did he miss all those years of the kind of person Travis really was. Mr. Strasser’s Liam also provides a breath-gasping account of the phone call he received just before Travis’ final act in life, with a look ghostly and with eyes welling even as he tries to account words that have difficultly coming. 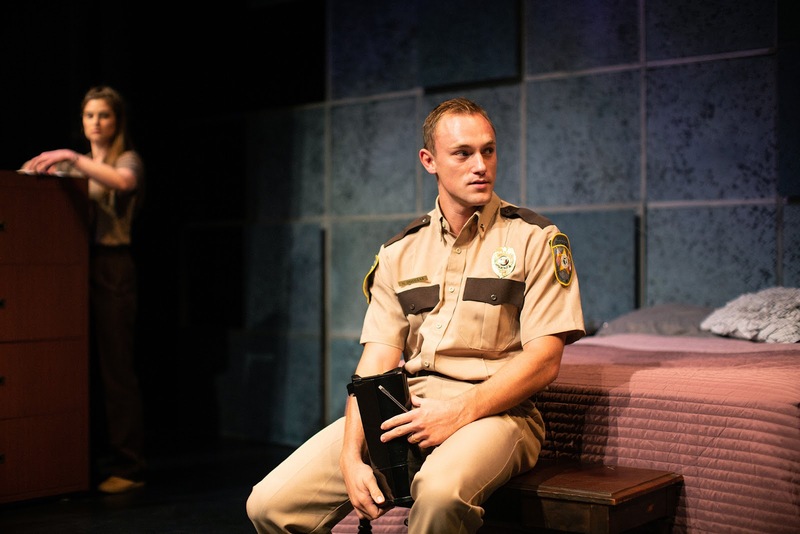 Andrew LeBuhn is haunting in his portrayal of eighteen-year-old Charles, brought into the family home by Mitch in an attempt for Annie to hear a first-hand account of the kind of person Travis actually was. As he tells his story with a foot that cannot halt its rapid trembling and hands whose veins almost pop as he rolls a jacket over and again, Charles’ appearance ignites a series of confrontations among the family that make earlier ones seem a picnic. Many choices both empathic and daring have been made by Director Jessica Holt; but striking in particular is the placement of family members as they confront and challenge each other. At one point when Annie is pitting herself against the other three, they stand without budging as the apexes of a triangle surrounding her. Later, when the family is at a near standstill of any mutual agreement or understanding, they stand in four corners -- each as if protecting his/her own remaining integrity and sanity while also joining in either the brutal attack or the over-blown defense of that of one or more of the others. Ms. Holt takes the emotion-ripping script of Mr. Halfnight and ensures that this cast leaves us as an exiting audience with impressions, insights, and questions that will stay with us for years to come. The director is joined by a creative team, first-class in every respect. 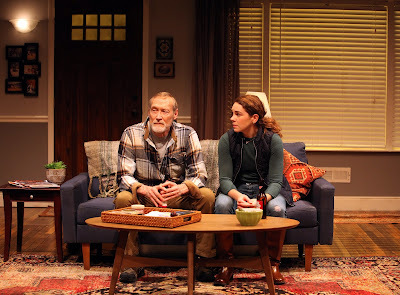 The living room setting created by Edward T. Morris could be that of any of our parents who grew up somewhere in the Midwest, with touches added by Jacquelyn Scott as props designer that at first glance, bring our knowing smiles of recognition. This is the home of Every Family, as we contemplate to what extent could this horrible set of events happen to Any Family, including ours. The lighting by Wen-Ling Liao creates effects leading to both spotlighted and subdued moments that will not soon leave our memories. Sara Huddleston’s sound design lures us into a home and neighborhood familiar, with music that attracts us curiously in the beginning and then later, wraps us in the heart-pounding scenes occurring before us. Finally, Shelby-Lio Feeney’s costumes write an entire description of personality and current predilections about each of the six characters. Live theater has the potential to bring together a group of strangers to experience an event that will impact each of their separate lives in ways they never dreamed upon entering. 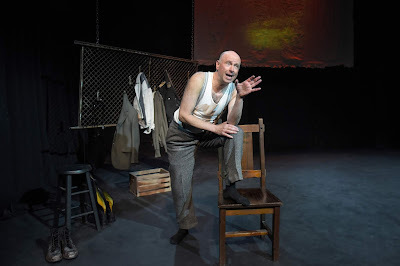 As premiered by Magic Theatre, The Resting Place by Ashlin Halfnight is live theatre at is most difficult, most impactful, most important best. 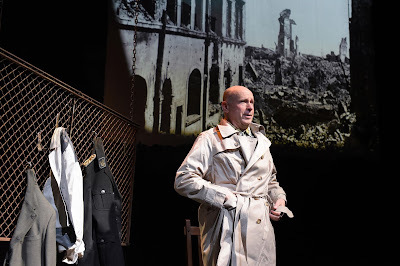 The Resting Place continues through November 4, 2018 in world premiere at Magic Theatre, Fort Mason Center, San Francisco. Tickets are available online at http://magictheatre.org/ or by calling the box office at (415) 441-8822. Continuing its tradition of periodically staging important classics on its small stage, Pear Theatre presents Henrik Ibsen’s 1891 Hedda Gabler in a modern-set adaptation by former Artistic Director and Founder, Diane Tasca. Starring current Artistic Director Elizabeth Kruse Craig as an insufferable, overbearing Hedda who habitually snarls with a smile cemented on her face, the Pear production has a current-day feel and look via the costumes of Melissa Sanchez and the set designed by Ting Na Wang. Even with some unevenness in the acting and directing, Ms. Craig's Hedda is a powerful draw to see this production. For my full review, please proceed to Talkin' Broadway: https://www.talkinbroadway.com/page/regional/sanjose/sj141.html. Hedda Gabler continues through October 28, 2018 at Pear Theatre, at Pear Theatre, 1110 LaAvenida, Mountain View. Tickets are available at www.thepear.org or by calling 650-254-1148. So opens Waitress, the Jessie Nelson (book) and Sara Bareilles (music and lyrics) delicious musical that continues to pack them in on Broadway since its 2016 opening and is also in the midst of a national tour, landing now at SHN’s Golden Gate Theatre. The main ingredients baked into this musical based on the 2007 movie by the same name include our apron-wearing heroine, Jenna, who sings with buttery beauty; her crusty co-worker, Helen, with tart remarks aplenty; her other waitress pal, cream-puff sweet Dawn stirred with much anxiety; and Cal, the salty, over-sized cook whose bitter bite is more show than real. Whipping in an appetizing mixture of music flavored with hints of pop, country, and ballad (all played by an outstanding, onstage band of six conducted by Lilli Wosk), Waitress is a dished-up dessert that is filled to the brim with domestic dilemmas, surprise romances, heart-warming friendships, and just enough fun and funny to make this pie a pleasant-tasting offering. With past starring roles in Wicked, Finding Netherland, and Rent, Broadway’s Christine Dwyer is an immediately likeable, clearly talented in all respects, Jenna. As she bakes and sings (“What Baking Can Do”) she remembers with soft, silky tones a mother who taught her all she knows about baking and dreams with sustained notes of increasing hope of a life where she does not continue to live in an abusive relationship, as did her mom. With scenes of her father beating her mother still cropping up in her moments of baking alone, she must deal with a brute of a husband, Earl (a repulsively convincing Matt DeAngelis), who daily takes her tips, drills her why there are not more, and then downs his beer amidst growled threats and glaring but lust-filled eyes. As her pregnancy blossoms, so does the attraction between doctor and patient – both married by the way. The two try to convince themselves in “Bad Idea” that their relationship is just that, but their cat-and-mouse dance around the examination table ends up on top with more than just the patient. More denying and more efforts to keep their doctor/patient distance runs counter to the gorgeously sung duet, “You Matter to Me,” where his tenor easily lifts to expressive, soft falsetto to combine so naturally with her underlying notes of equal beauty. 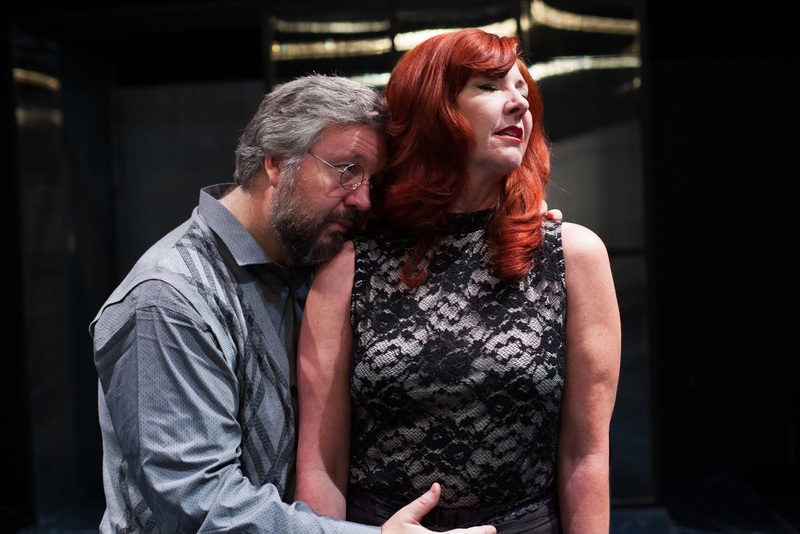 Ms. Dwyer and Mr. Fenkart play with masterful moves and often funny results the magnetic attraction/repulsion game where heart/lust and brains/morals are in constant conflict – until they are not. Watching their cat-and-mouse game is Nurse Norma (Rheaume Crenshaw), clearly disapproving with her loud huffs, puffs, and snide one-liners but still more than willing to enjoy Jenna’s calling-card pies. Other romances are also baking in the oven; and each is just as unlikely. 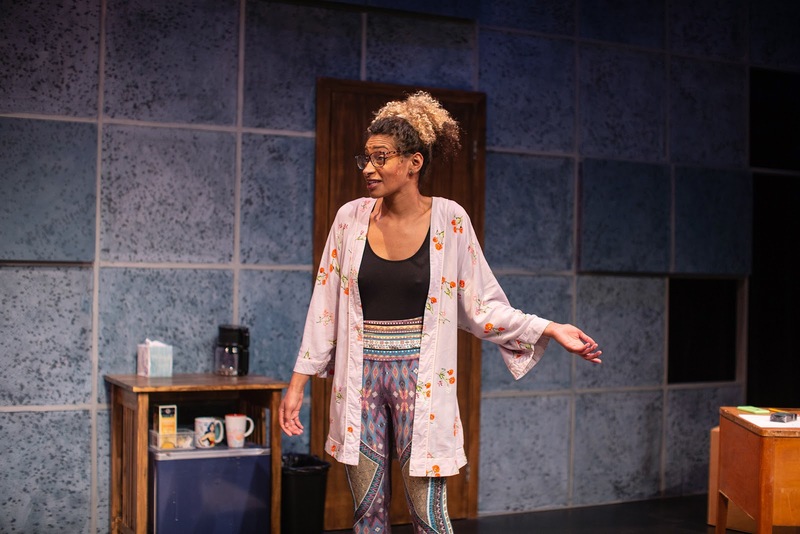 Chief among these is between a frenzied, always nervous Dawn (played with shrill by Jessie Shelton) and her online, blind date Ogie, who shows up at the café after their previous night’s first, five-minute date to steal the show and eventually Dawn’s reluctant heart. 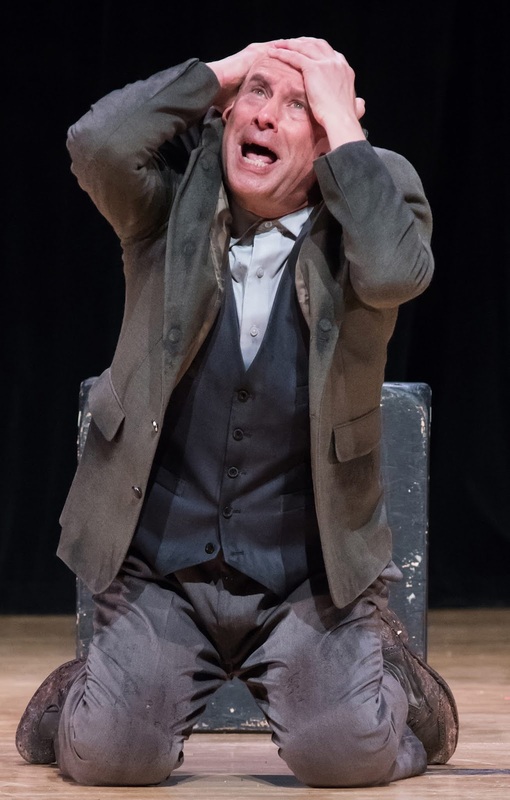 As the oddball Ogie, Jeremy Morse easily receives the night’s biggest laugh-filled applause as he jumps, stomps, screams, and sings his way into Dawn’s life in “Never Ever Getting Rid of Me.” Their love becomes sealed when he reveals he has played Paul Revere in American Revolution reenactments, something the Betsy Ross in her can relate. When they later sing a hilariously staged “I Love You Like a Table,” the quirky sounding voices of both blend perfectly for a union sure to come soon. Advice to Jenna on how she needs to leave Earl before her baby arrives comes from varied sources. The aged curmudgeon and owner of the diner, Joe, is played with an outer hard crust by Larry Marshall but with increasing signs of a soft interior and some wise words for his favored waitress, Jenna. Both he and Becky encourage her to enter a pie-baking contest with a first prize of twenty grand (and thus a ticket to escape the abusive Earl). Anastacia McCleskey brings her commanding vocals to bear in “I Didn’t Plan It” for a jarring wake-up call that Becky gives Jenna: “Look around you, ain’t no saints her, baby; we’re all just looking for a little less crazy.” Like old Joe, her outside brusqueness combined with oft-bawdy remarks to hide a heart bigger than sky-high meringue. We see that heart in moments like the mesmerizing trio she sings with Jenna and Dawn, “A Soft Place to Land,” where their individually sung lines flow in repeated rounds into beautifully blended harmonies. “You have a dream is a soft place to land, may we all be so lucky” is just one of many examples where the lyrics and music of songwriter/actress Sara Bareilles work so well to make Waitress much better than one might expect from yet another movie-based musical. A diner full of all the trimmings from cubby-holed kitchen to multi-layered tables full of hungry patron) is part of the main set designed by Scott Pask. Other scenic elements from Jenna’s pie-making, shelf-encased corner to her drab, clearly unhappy apartment appear/disappear seamlessly. 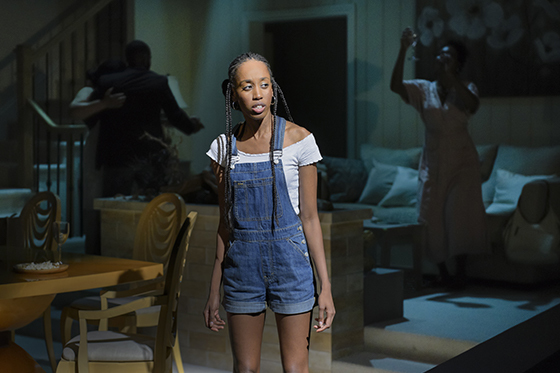 A scenic backdrop of a cloud-enriched Southern sky is painted with a lighting design by Ken Billington that provides dawn’s hope even when the storms of the story are most threatening and even when the tilted shadows of windows in the apartment suggest no hope of escape. Suttirat Anne Larlarb’s costumes help define a southern, small-town collection of personalities that are often stock in nature but unique with touches that make them memorable. Director Diane Paulus combines forces with Music Director Robert Cookman to blend musicians and acting ensemble into an orchestra of sorts of instruments and clapping hands that provides effective, mood-setting/altering backgrounds to the story. There is nothing that feels like ‘this is just a touring version’ of the Waitress now at SHN’s Golden Gate. From set to sound to staging, Waitress has that Broadway look and appeal with a cast that sells itself in song and portrayals and a story that is a good mix of funny (even silly), romantic, hard-hitting, and uplifting. Waitress continues through November 11, 2018 at 1 Taylor Street, San Francisco. Tickets are available at Tickets are available at https://www.shnsf.com. Waitress opens at London's Adelphi Theatre for an extended run on February 8, 2019. Tickets are available at https://seatplan.com/london/adelphi-theatre/. Guggenheim Entertainment is now staging at its 3 Below Theatres and Lounge an rip-roaring, rambunctious, and riotous The Mystery of Edwin Drood -- Rupert Holmes’ 1985 musical that garnered five Tony Awards out of eleven nominations, including Best Musical. As soon as the theatre’s two aisles fill with a variety of jovial, oddball characters dressed in late-nineteenth century wear – stopping along the way to greet audience members as if old friends – it is clear that this is not going to be a typical musical outing. 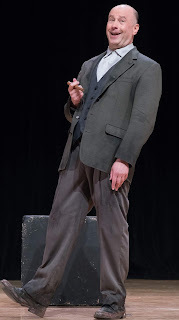 We soon realize that we are watching something that has aspects of a rowdy, English music hall in the 1890s, of a contemporary Gilbert and Sullivan operetta, and of the yet-to-appear Vaudeville shows of the U.S.A. Please proceed to Talkin' Broadway for my complete review: https://www.talkinbroadway.com/page/regional/sanjose/sj140.html. 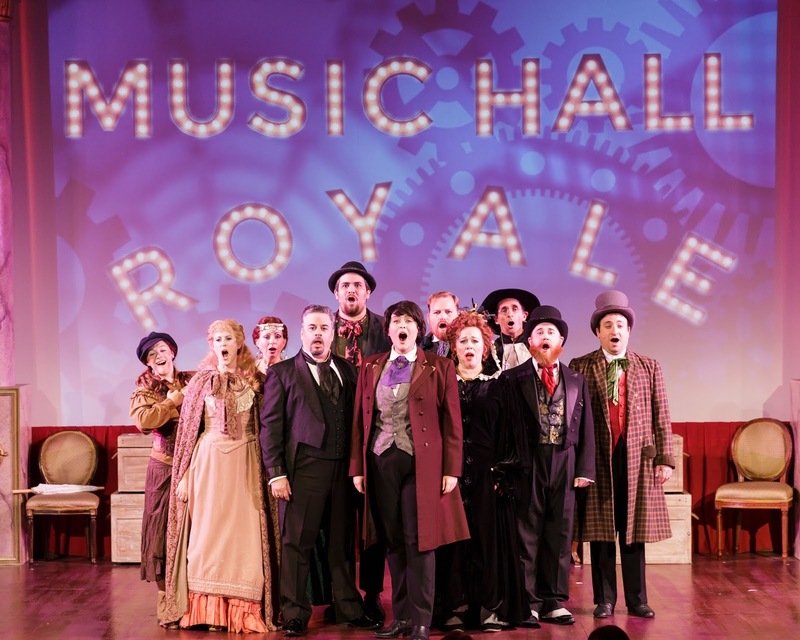 The Mystery of Edwin Drood continues through November 11, 2018 by Guggenheim Entertainment at 3 Below Theatres & Lounge, 288 South Second Street, San Jose. Tickets are available online at https://3belowtheaters.com/. For the first forty minutes or so, we seem to be watching what one character calls, “a good ol’ family drama ... a slice of life ... nothing big and flashy ... just a real story about real people.” The situations are familiar for anyone who has watched TV sitcoms like Good Times, The Jeffersons, or Family Matters; and the laughs coming from us as audience begin to sound like a piped-in, predictable laugh track. The clearly upper-middle-class, African American family – in this case, the Drury Family – is preparing for Grandma’s big birthday dinner. Grown-sister rivalries erupt in the same snippy back-and-forth retorts of a lifetime together; a hubby would rather smooch than help set the table; a rebellious teenage daughter has no compunction putting her tennies on the expensive couch or in arguing for the umpteenth time this week with her exasperated mom; and a brother once again is going to be late for the most important family event of the year. 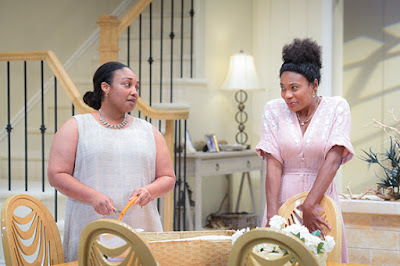 All is predictable in what we (i.e., the mostly white, as usual, theatre audience at Berkeley Repertory Theatre) expect from this kind of family comedy (i.e., one about a modern-day black family in the U.S.). 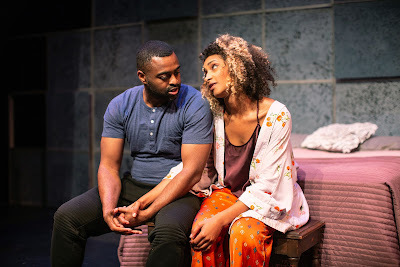 That is, all is going as we expect until it definitely is not; and then the joint world premiere between the Rep and Soho Rep of Jackie Sibblies Drury’s fairview takes us into territories not yet crossed by many, if any, prior premieres on this or any other American Stage. If a 9.0 earthquake had just occurred on the Hayward Fault underneath us, the upheaval, disorientation, and aftermath of “what just happened?” would not be much different. But rather than resulting destruction, the shake-up in fairview has the possibility of helping us – the white audience – rethink and reconstruct our own views of what we thought it is like to be in the skin of African Americans in 2018. 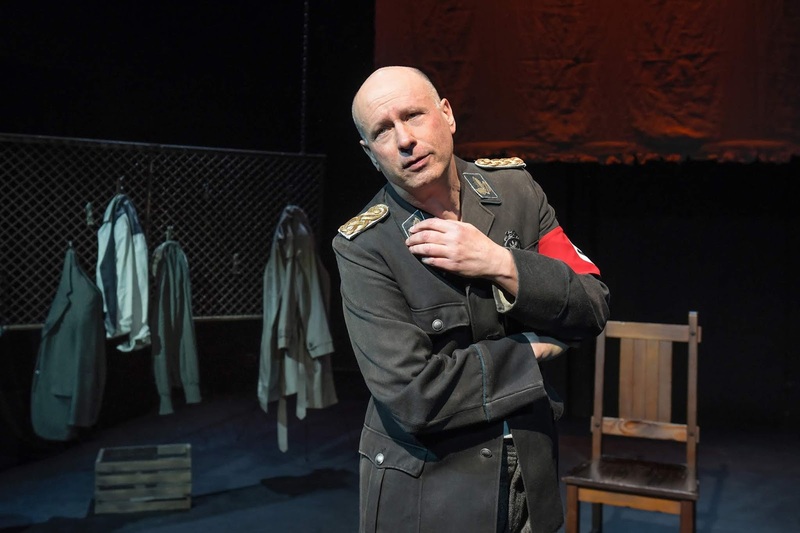 The aftermath of this monumental and important play is that many unanswered questions must first be faced and only over time with much soul-searching consideration, hopefully answered. 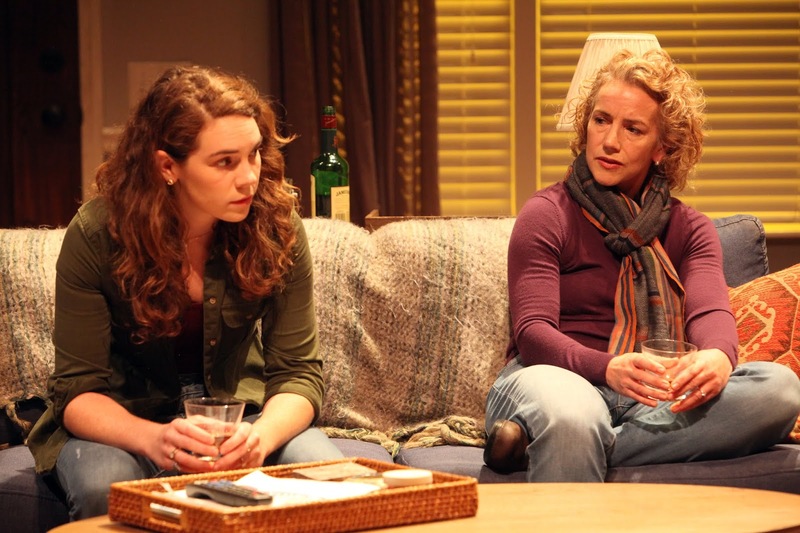 The experience of seeing fairview is a carefully, deliberately constructed sequence by playwright and Director Sarah Benson of the audience being at first mildly entertained, then surprised, confused, still amused but in a weird and increasingly uncomfortable way, clearly troubled and squirming in our seats, and finally disoriented and probably uncomfortable as the unthinkable request is made of us. Why and how that sequence occurs cannot be revealed in a review. All I as reviewer can do is to urge every reader not to miss the opportunity to experience a theatre event that will surely be much discussed and revisited in dining rooms, wine bars, and university classrooms for years to come. There are early hints that what we are observing is not exactly what is really going on. As host Beverley (Natalie Venetia Belcon) hurriedly peels a pile of carrots while listening (and then dancing with hips and shoulders swiveling around the room) to Sly and the Family Stone’s It’s a Family Affair, there is suddenly a static-peppered interruption with a deep, threatening voice-over nondiscernable -- until all returns to what seems normal. The same happens later when her rose-sipping, just-let-me-sit-and-watch-you sister, Jasmine (Chantal Jean-Pierre) takes a saunter around the room to the music. 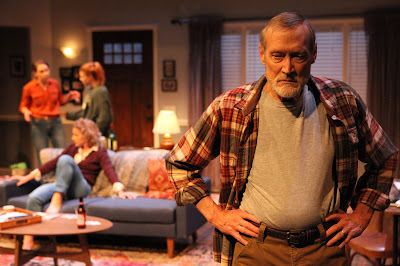 Beverly’s husband, Dayton (Charles Browning) comes and goes, trying to keep his overly anxious/worried/perfection-seeking wife calm and to tell her everything is going to be OK. 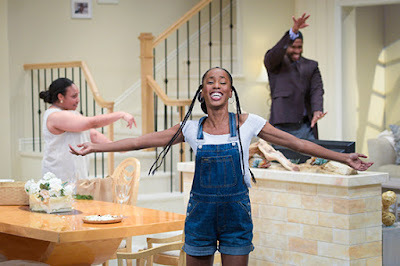 But it is when teenage Keisha (Monique Robinson) looks into an imaginary mirror separating the family on stage and us as audience that we get the hint that something we do not yet understand is going on. She senses all is not quite right when she says to herself, “I want to be all I can be ... But I feel something is keeping me from being all I can be.” As she says this in a musing, somewhat disturbed voice, she is looking directly into that unseen mirror ... and thus, at us. It is Keisha who will eventually be the incredible force that moves us as an audience to reconsider what it means to be us in relation to her -- a young, black, aspiring teenager in America. Ms. Jean-Pierre is one of eight in this ensemble who each will push through boundaries to provide performances that shatter what we expect of them. 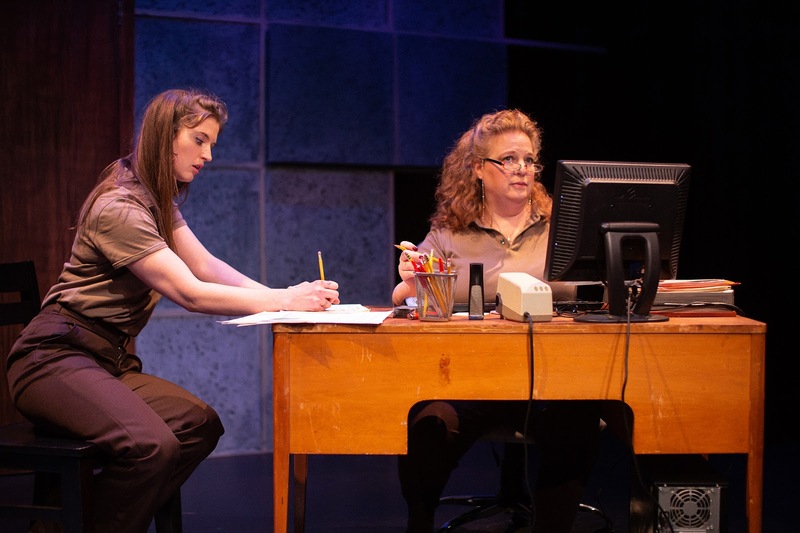 Sarah Benson’s one-hour, forty-minute play is divided into three distinct acts with no intermission. The first act is the one described above; the next two are when the presence of white people (Natalia Payne, Brooke Bloom, Luke Robertson, Jed Resnick) intersects with the lives of the Drury’s but in ways powerfully unusual and unsettling and unable to be described without ruining the experience for you, the hopeful, next audience. Everything that the production staff has done to set the stage and to move along this familiar-comedy-turned new-genre-drama has been highly and specifically done so with purpose. Mimi Lien has designed an exquisite home for the Drury’s -- all in whites and beiges – that is full of good taste and style and is walled off by a low, black wall separating it and us, the audience. It looks perfect -- for now at least. The sound design of Mikaal Sulaiman does much to lure us initially into areas of comfort and hum-along complacency while later imposing in commanding ways a soundtrack that will upend our view of what is really happening. The lighting of Amith Chandrashaker focuses us at times on the inner thoughts of family members (like those of Keisha) and will at one point, place us in the spotlight in a way we probably never have previously experienced as audience members. Costumes by Montana Levi Blanco also fool us in the beginning and later shock us into seriously questioning what is the reality we are assuming of the events taking place. All has been orchestrated by a director (Sarah Benson) who clearly has worked in close partnership with Jackie Sibblies Drury for incredible synchronization of words and actions that often play in totally different dimensions to produce effects powerful, thought-provoking, and question-arousing. Is the white majority’s view of the black minority in America a “fair view”? What would be a “fair view”? Should there be a view at all? How can or even can African Americans escape the view of the majority, and why is it necessary that they do? These are just a few of a myriad of questions going through my head this morning after experiencing fairview last night. Many new ones will surely emerge in the days and weeks to come. Berkeley Repertory Theatre (in association with Soho Rep) has once again proven why the company is one of the nation’s leaders in staging productions that literally smash prior, well-established boundaries. 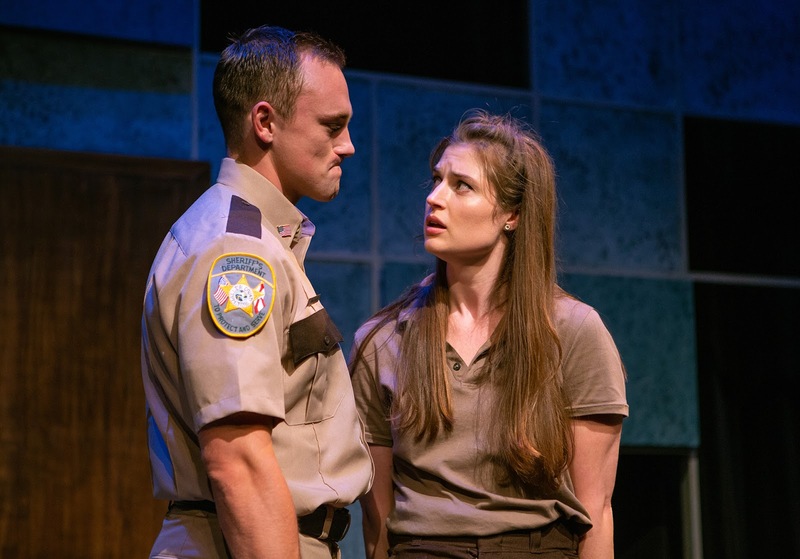 Never will the so-called fourth wall seem quite the same after a visit to fairview, and never will audience members think of race relations in America as they did when they arrived. fairview continues through November 4, 2018 in Peet’s Theatre of Berkeley Repertory Theatre, 2015 Addison Street, Berkeley, CA. Tickets are available at http://www.berkeleyrep.org/boxoffice/index.asp or by calling 510-647-2975 Tuesday – Sunday, noon – 7 p.m.